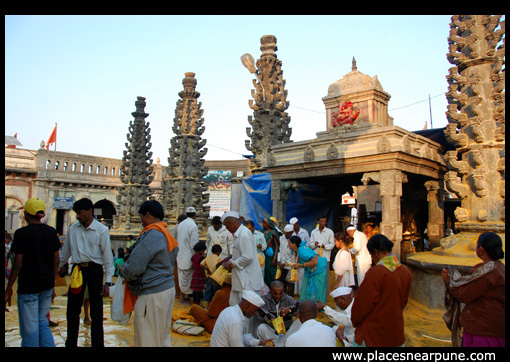 If you are even slightly allergic to turmeric or the colour yellow, don’t even think about going anywhere close to Jejuri! 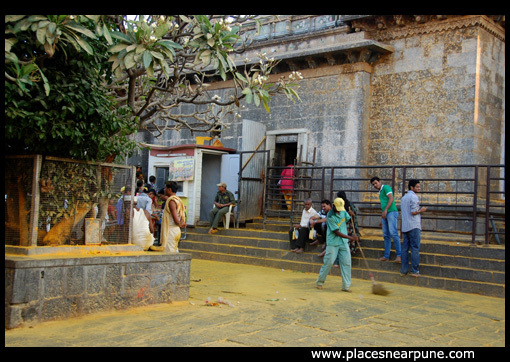 But, it is this splash of yellow along with the red of kumkum which makes this temple a riot of colours. 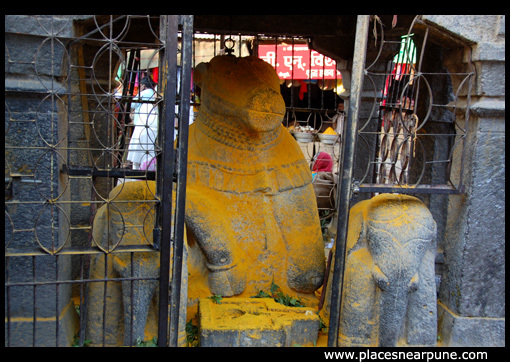 Khandoba is a tribal deity (and a powerful one) and considered to be an incarnation of Lord Shiva. 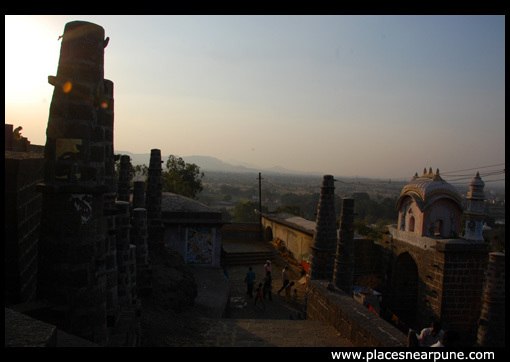 The temple is on a hillock originally called Jayadri and now is known as Jejuri. 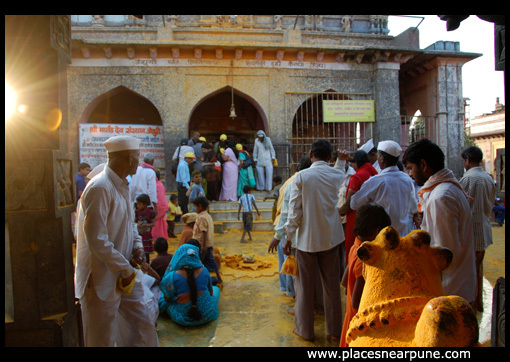 It is said that God manifested himself as a turmeric to a group of shepherds and hence turmeric is considered sacred at Jejuri temple. 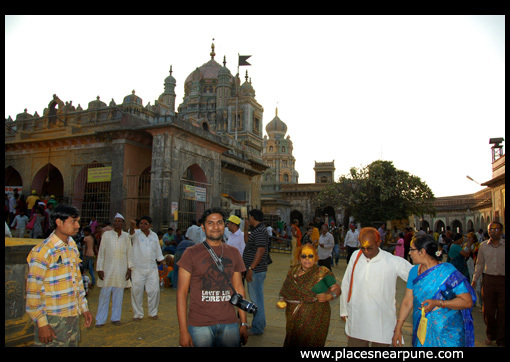 How to go to Jejuri Temple from Pune: Jejuri is around 45 kms from Pune (Magarpatta). You have to take the sasvad road and keep going until you reach Sasvad. At sasvad, there are exits for the Balaji temple and Bhuleshwar. 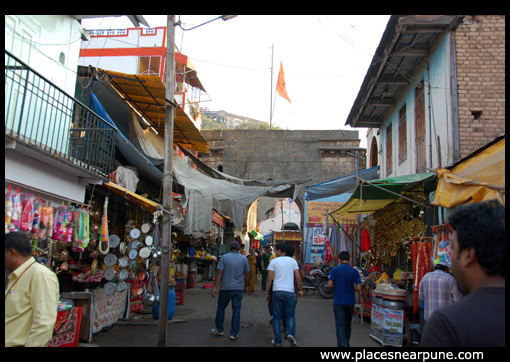 But, if you keep going straight, Jejuri is another 18 kms away. There is ample parking at the base of the hill. It seems that there are two paths to go up. The one on the back side is supposed to be longer. The way to the top from the front has around 350 steps to be climbed. 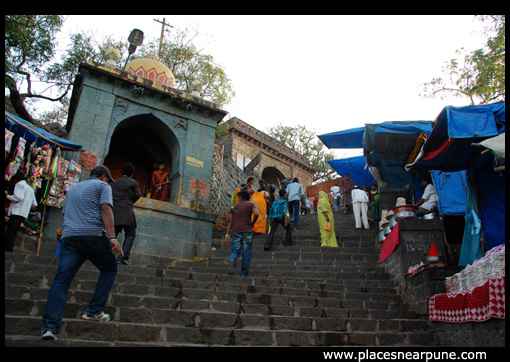 But nothing much to sweat about, as you would by occupied gazing at the dozens of stalls all along the climb. All along the stairs, there are many deepmalas. It would be a great sight when all of them are lit up, have to find out when that happens. 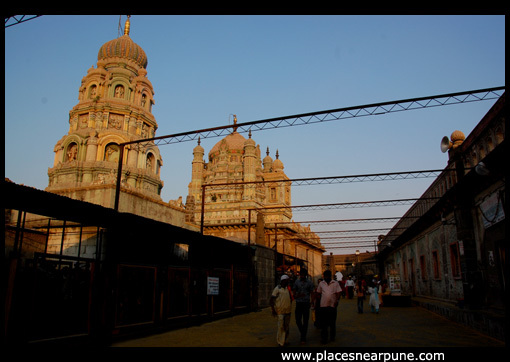 This temple is for an avatar of Shiva, so expect a big crowd on all the shiv-friendly days. Once near the top, there is a “resting place” which also doubles as a view point. 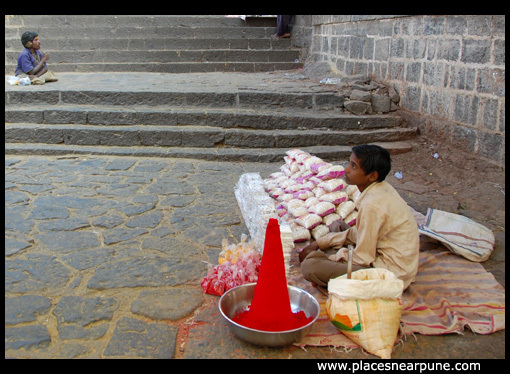 You leave your slippers here and climb a short flight of steep stairs to reach the temple. If you are carrying an expensive camera, be extremely careful with it. Turmeric dust is very fine and if it gets into the lens (of SLRs), you are in serious trouble. In front of the main shrine, devotees throw turmeric in the air chanting the god’s name. We didn’t go into the shrine as there was a long queue that day. 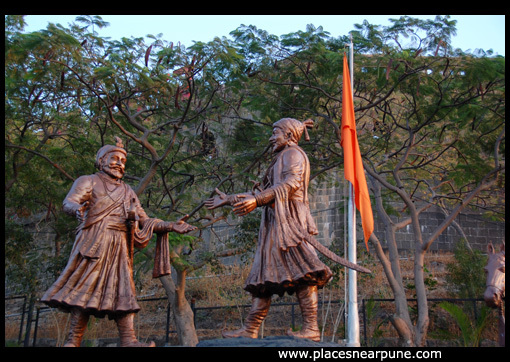 It is also said that Shivaji’s father has been in the south for a long time with Shivaji in Pune. 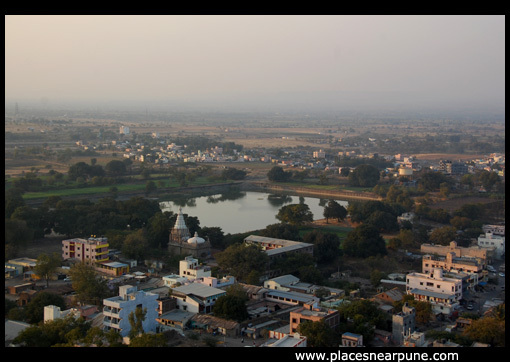 When his father came to see him, the foothills of Jejuri was the place where Shivaji met his father. There is also a “museum” kind of setup having statues describing this meeting. In the evening light, the statues have an aura around them. 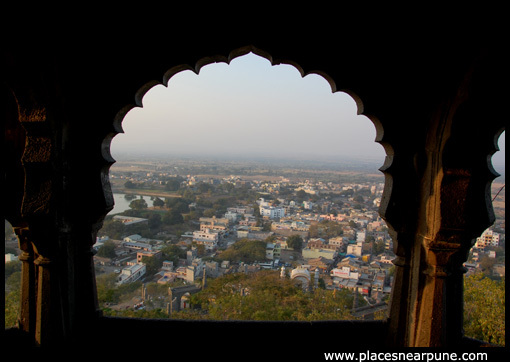 If you are the kind that loves to know the history of a place that you visit, then you should e a regular on Abhijit Rajadhyaksha’s blog. I usually take a printout of his entry and then take it with me and that helps me understand a lot more about the place without which i would just be clicking photos. 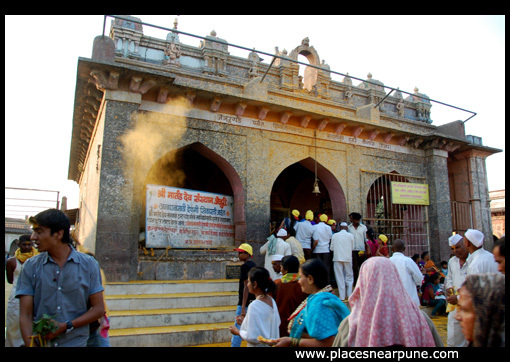 For the history of Jejuri, check out his entry here. 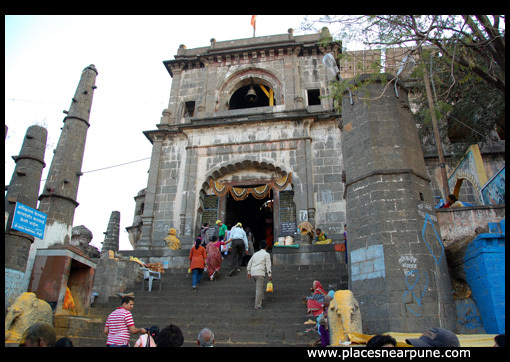 There is one more temple of Khandoba on top of the larger hill called Kadepathar. Good views from there. what abt lunch arrangements there ? yes, i have seen them being used.